Davis: Velotopia, USA – WeLove2Bike! 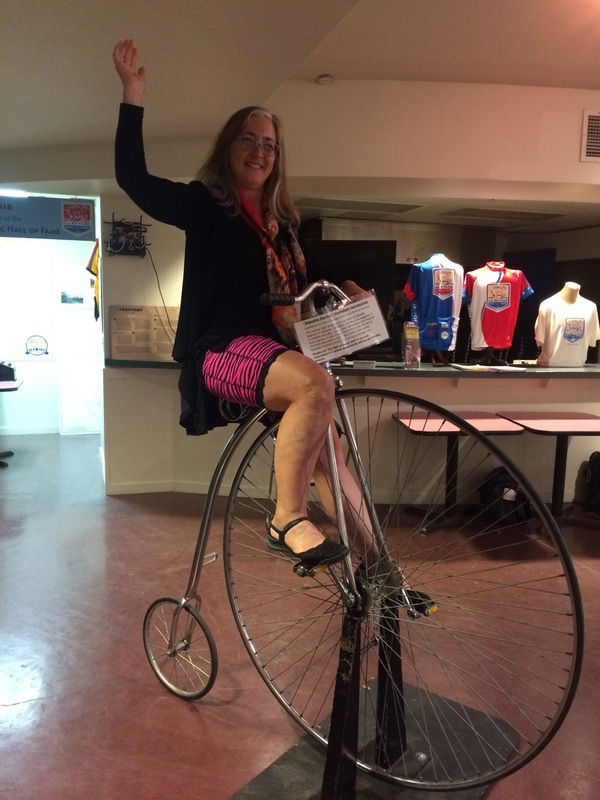 Back in 2012 I attended the National Women’s Bike Summit in Long Beach, California. I really didn’t know what such a summit would look like, but the mere fact that it existed, and so close to Los Angeles, compelled me to register and check it out. It was so inspiring to be surrounded by so many women who are as excited about bicycling as I am. One of the women I met there is Maria Contreras Tebbutt from Davis in Northern California. Maria told me about the work she does in Davis and nearby Woodland, helping people in the community with access to bicycles and repairs. 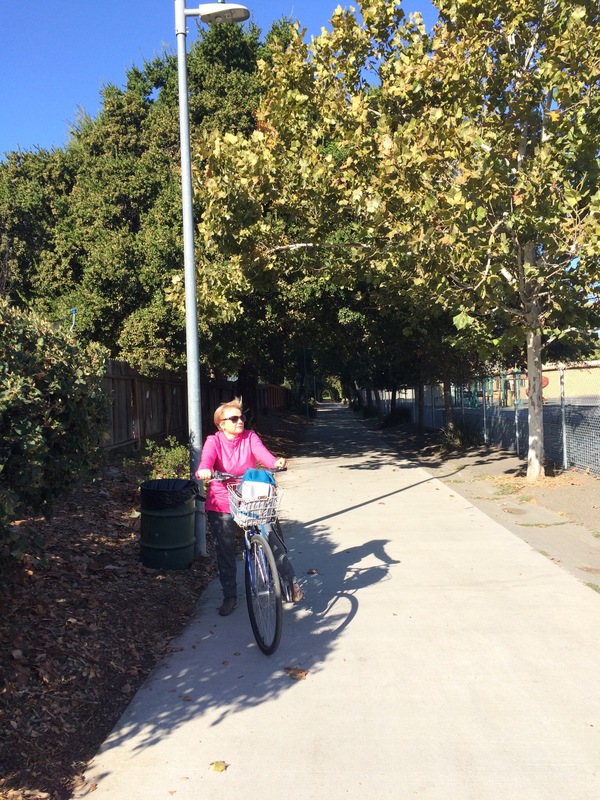 It was through her that I first learned that Davis is an incredible bike city with a remarkable history exemplifying how a US city can be designed to work for bicycles. 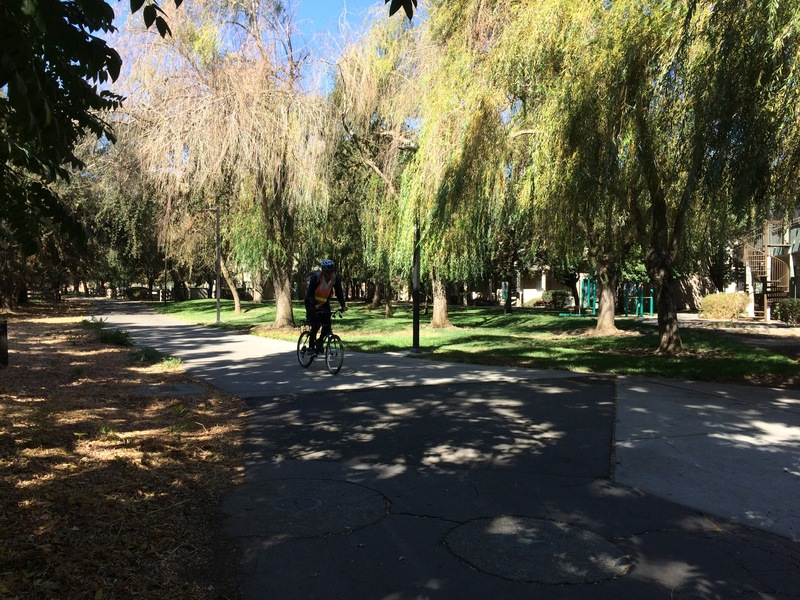 Ever since then, a visit to Davis has been on my bike-it list. Every now and then, I would look online to see if there were any bike events coming up in Davis that might give me an excuse to go there and perhaps sell my bloomers. 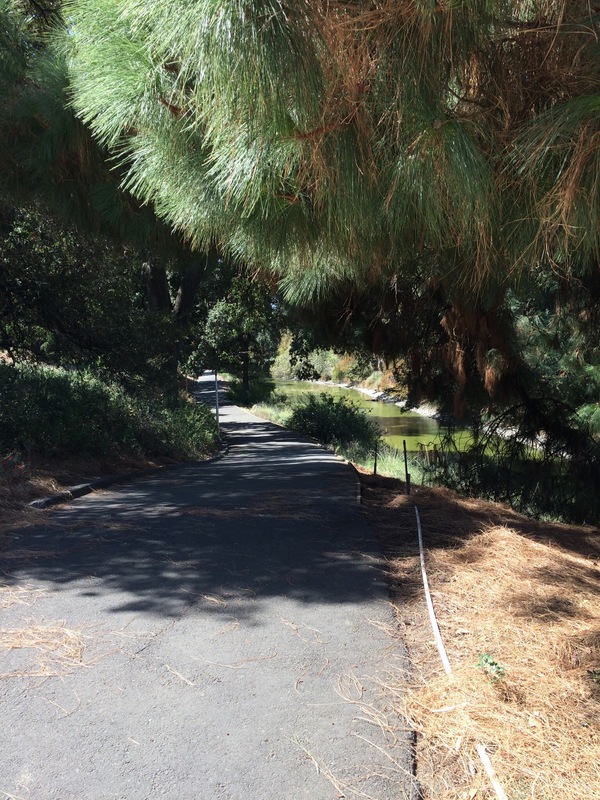 Finally, in August, I discovered just what I’d hoped to find, a great excuse to go to Davis. 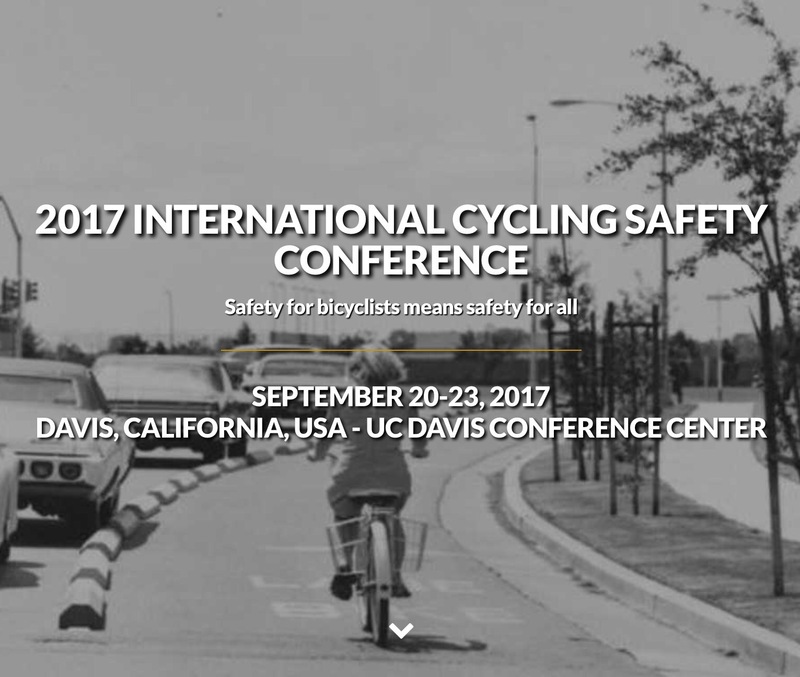 I stumbled across an announcement about the International Cycling Safety Conference that was going to be held in Davis. 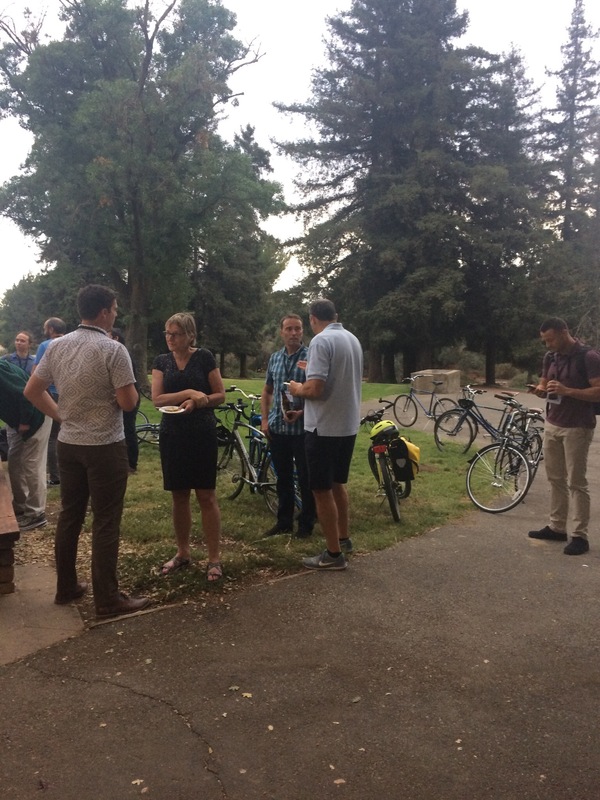 The Conference was being held in conjunction with the celebration of 50 years since the first bike lane was installed in Davis. This was also the first time the International Cycling Safety Conference was being held in the United States. I checked the conference website to see if there might be an opportunity for vendors there. They did have some sponsorship opportunities, although it was a little pricey for my micro business budget. I decided it was worth inquiring to see if there was a sponsorship level that I could afford and that would allow me to at least display my product, if not sell it. I was figuring there would be people coming to this conference, not only from all over the states, but also from other countries, all of them enthusiastic about transportation cycling — just my kind of people. I also looked at the program, and saw that many of the speakers were women, giving me hope that this wouldn’t be one of those bicycling events dominated by males. The response from the conference organizers was favorable, so I decided to just do it. I booked a hotel, paid my sponsorship and registration fees, and started thinking about how I would present my product to this audience. 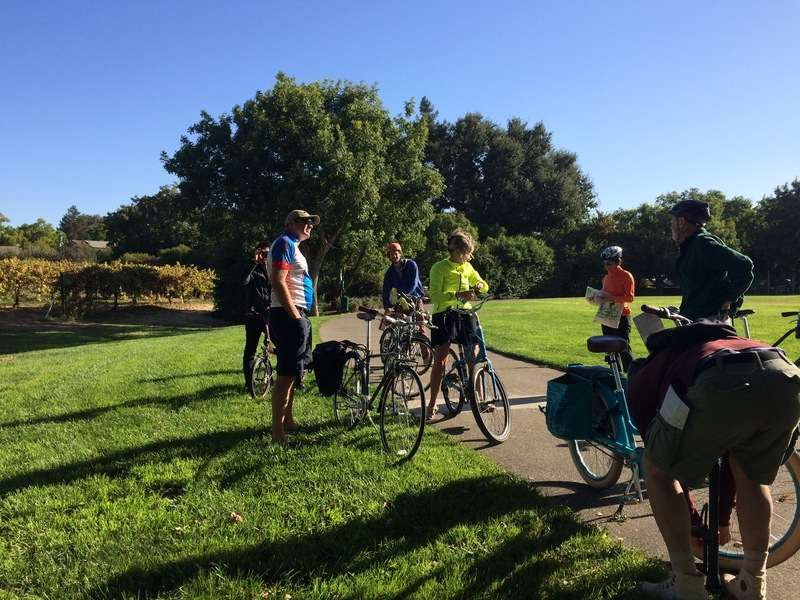 I was also excited to see that the program included an opportunity to participate in the Davis Bike Party on Friday evening, and also to get a tour of the bicycle infrastructure of Davis on Saturday. Never having attended a conference of this nature, I wasn’t quite sure what to expect. But, that Wednesday, I packed my car with all my Bikie Girl Bloomers product and display set-up, and drove up to Davis. As it turned out I arrived just in time to catch the last part of the opening night reception. I didn’t have a name tag yet, and although I recognized Maria among the attendees, she is obviously a popular celebrity in this social circle, and I never did get a chance to talk to her. But I met a nice couple who lives in Davis: Steve Tracy, and his wife, Susan. Susan was not part of the conference and seemed happy to talk to someone who also felt like a little bit of an outsider. She is a retired schoolteacher, and he is a retired Davis city planner. 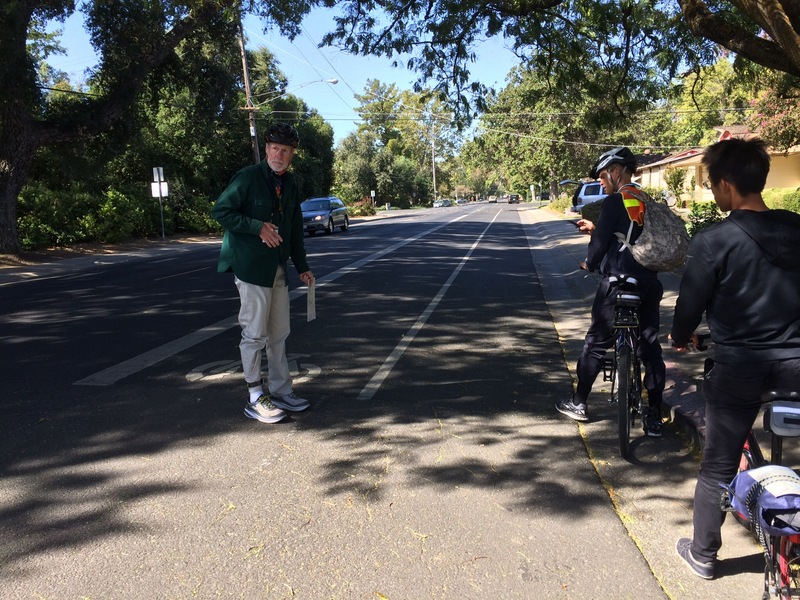 I learned that Steve would be leading one of the five tours on Saturday, and decided that I would sign up to join his tour, since he obviously has extensive scoop on the history of Davis’ bike infrastructure. Thursday morning I drove to the campus and set up my display. It turned out I was one of only two sponsors with display tables at the event, and they had put us at the opposite end of the conference building lobby from where all the attendees were congregating, an unfortunate arrangement. 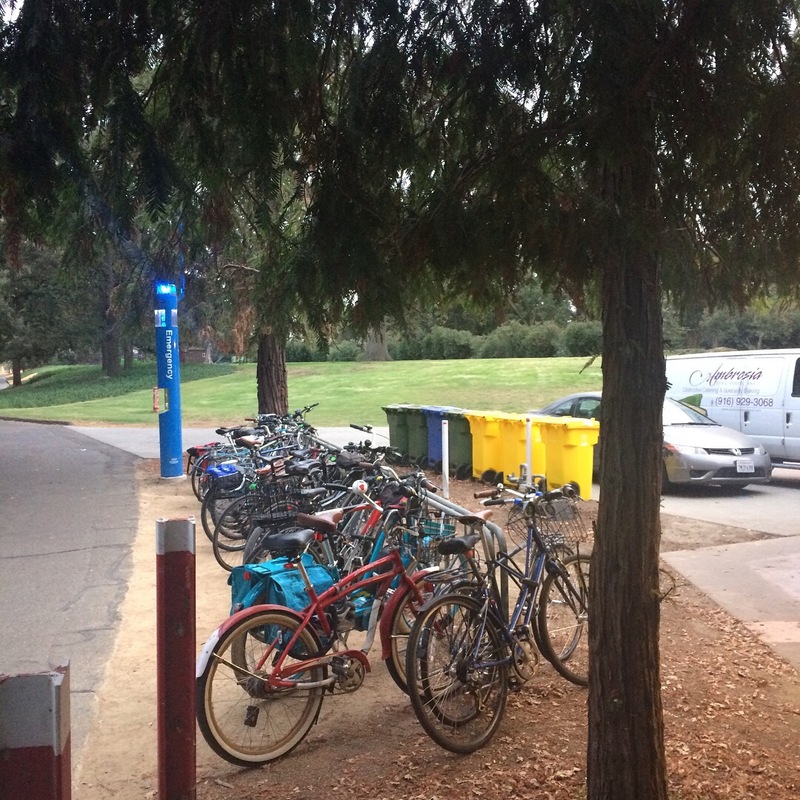 I then was able to walk over to the campus Bike Barn that I’d heard about, a facility started by Maria Tebbutt to provide an on-campus service for all student bike needs, including sales service, rentals, and accessories. 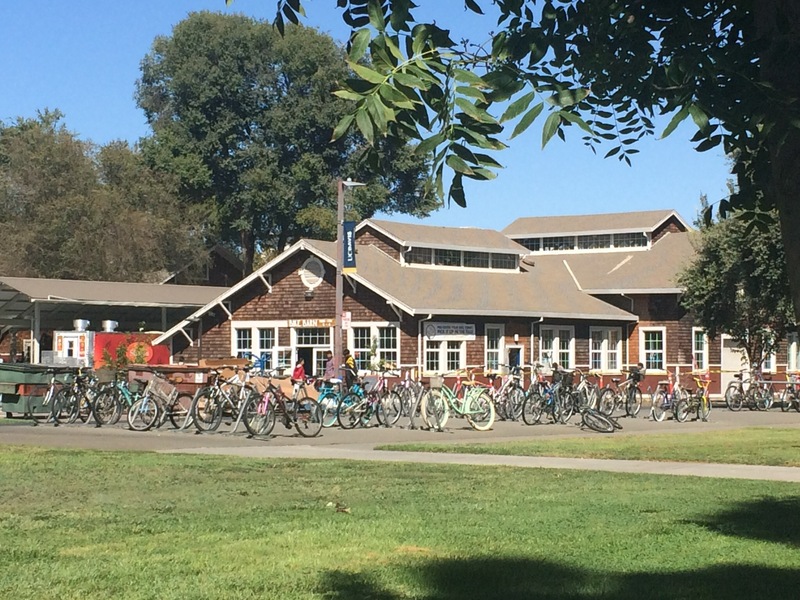 The conference organizers had made arrangements so that registrants could borrow a bicycle from the Bike Barn to use during our stay. 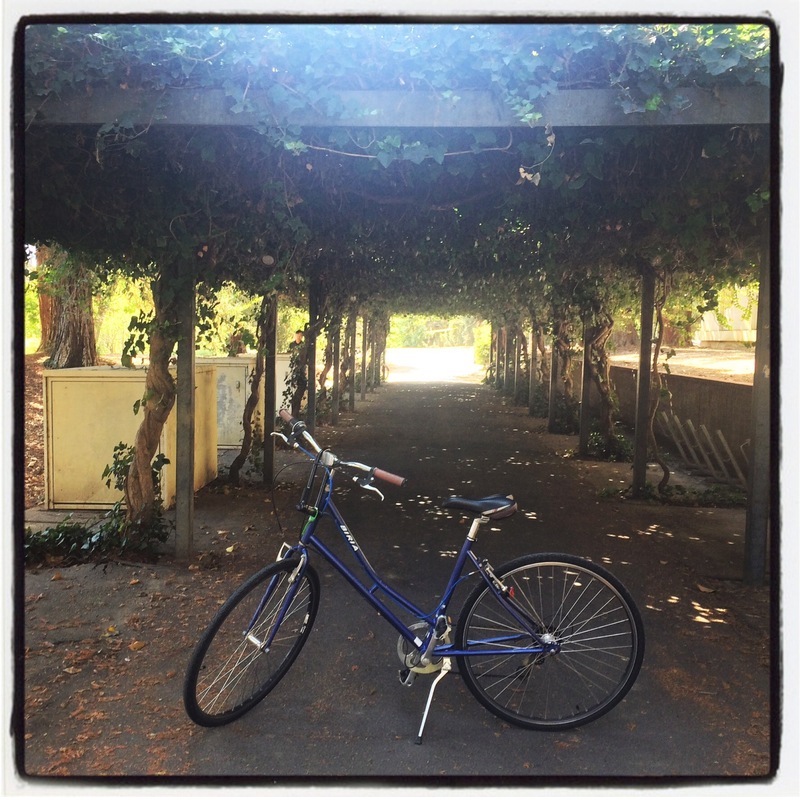 So I picked up my bike, and enjoyed exploring the campus on two wheels. 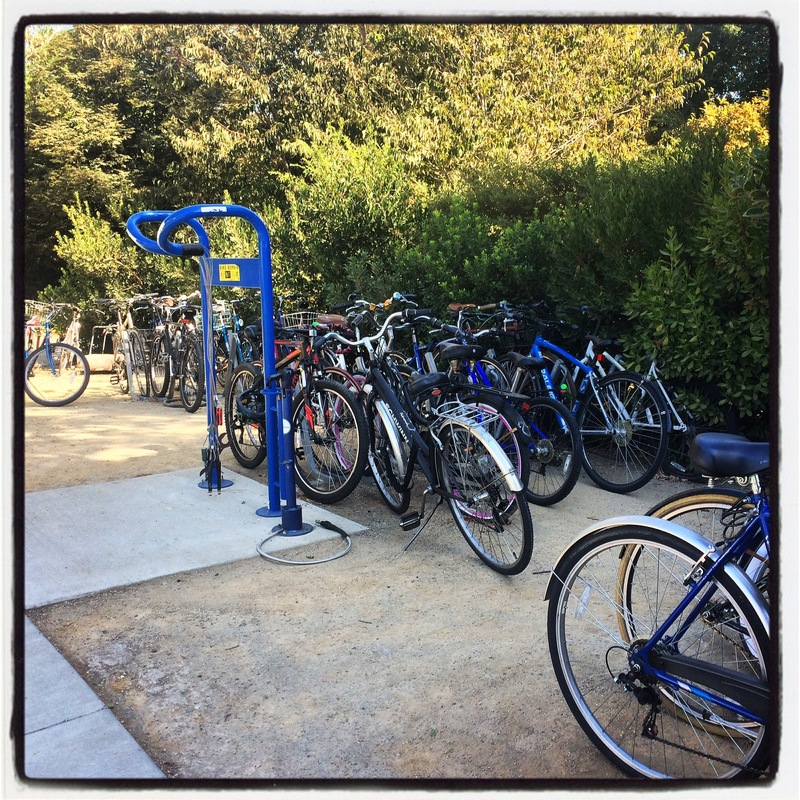 It quickly became apparent that this was unlike other college campuses I’ve seen, in that it was clearly designed to facilitate moving around campus by bicycle. There were bike paths and traffic circles everywhere. I had fun marveling at the vast arrays of bike racks, the many bike repair stands, and thoughtful infrastructure details designed especially for cyclists. I loved my table of bike nerds. We had folks from Vancouver, Toronto, Atlanta, Davis, Iowa, North Carolina, and, well, you get the idea: cities of varying sizes and cultures. It was helpful to think about how the cultural context influences the factors that affect women’s interest and comfort with cycling. 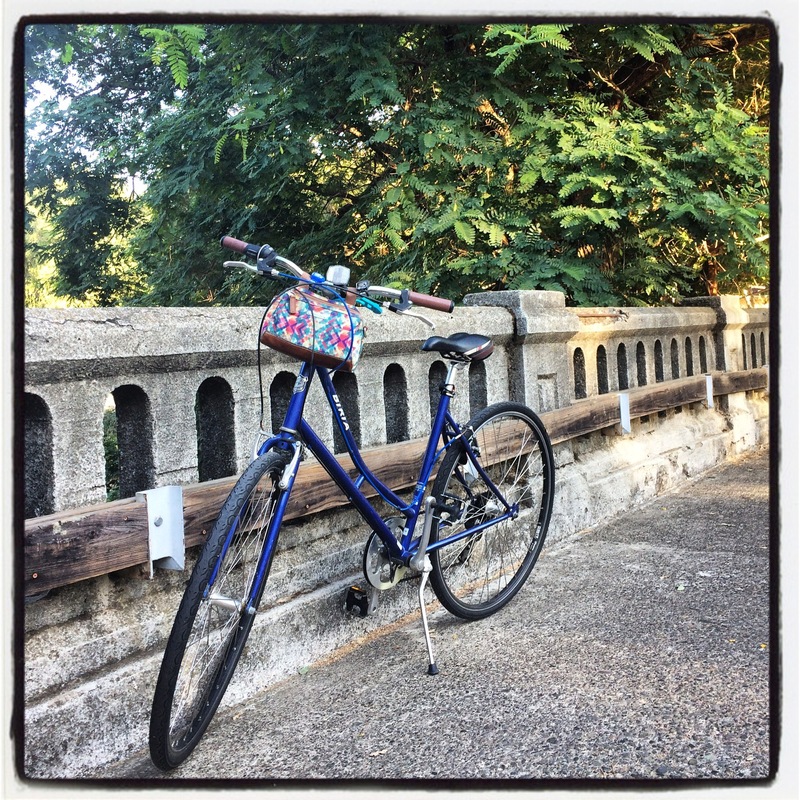 I shared my hope to get more women cycling by expanding the notion of what we wear while biking (it’s not only OK, but fun and comfortable to bike in a skirt, plus you don’t have to change clothes when you arrive at your destination). Others talked about women who worry about helmet hair, or safety. Certainly one takeaway is the appreciation that no one approach will get more people cycling everywhere, and such efforts must take into account the local culture and conditions, and also provide a variety of ways to draw folks in. The locals gave me pointers on the best bike route back to my hotel that night. I’m so glad, as Google Maps was directing me toward a very high traffic route, when a much more pleasant, low stress route was available. It got a bit odd at one point, though, when I realized I wasn’t on a road any more. I had missed a right turn, and suddenly, in the dark, found myself riding through a parking lot, which wasn’t so bad, but then I found myself riding across what seemed to be a grassy, bumpy field. I managed to find my way back to a road eventually, and all ended up fine, but in the light of day the next morning, I could see my folly. 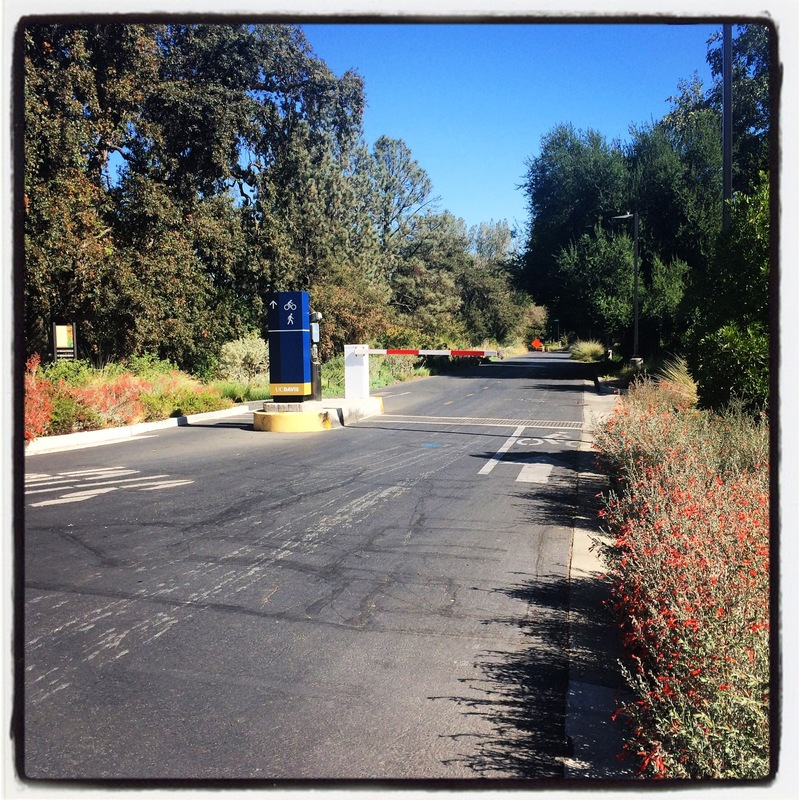 Then I missed a turn on my way into campus that morning, and ended up at a dead end before realizing I needed to turn back about a quarter of a mile to catch the bike path that leads to the campus. All part of the bike adventure! In my view, we should design all of our roads with the intent that our children can bike to school safely on them. Have you ever noticed how much traffic congestion worsens when school is in session? So many parents are chauffeuring their children to school, with individualized door-to-door service, it adds tremendously to the number of trips taken by car each morning and afternoon (not to mention creating a chaotic traffic nightmare in front of school buildings). Meanwhile, the children are kept dependent on their parents for transportation, and fail to learn their way around their own city. Studies have shown that children who bike to school perform and learn better than their car-bound classmates. We can all benefit from a safety-oriented road design. Friday evening was the big night of celebration. 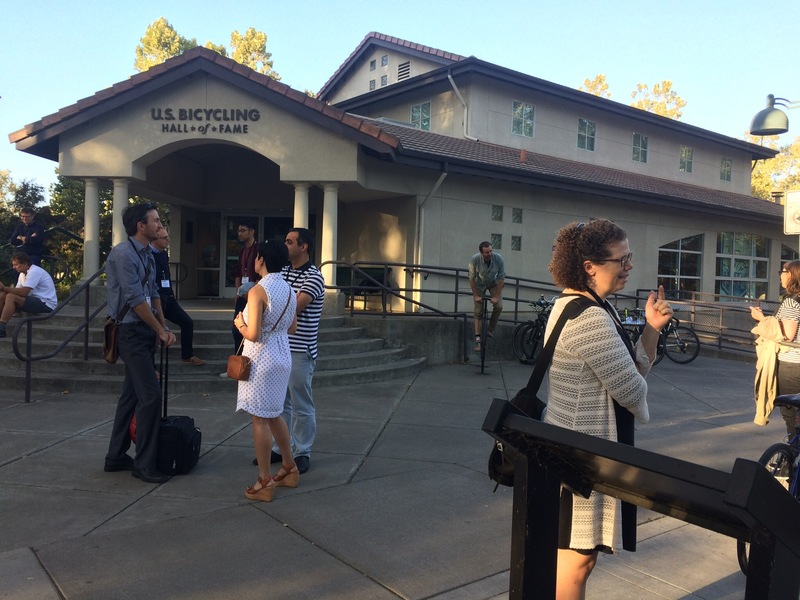 First, we had a reception at the U.S. Bicycling Hall of Fame in downtown Davis. 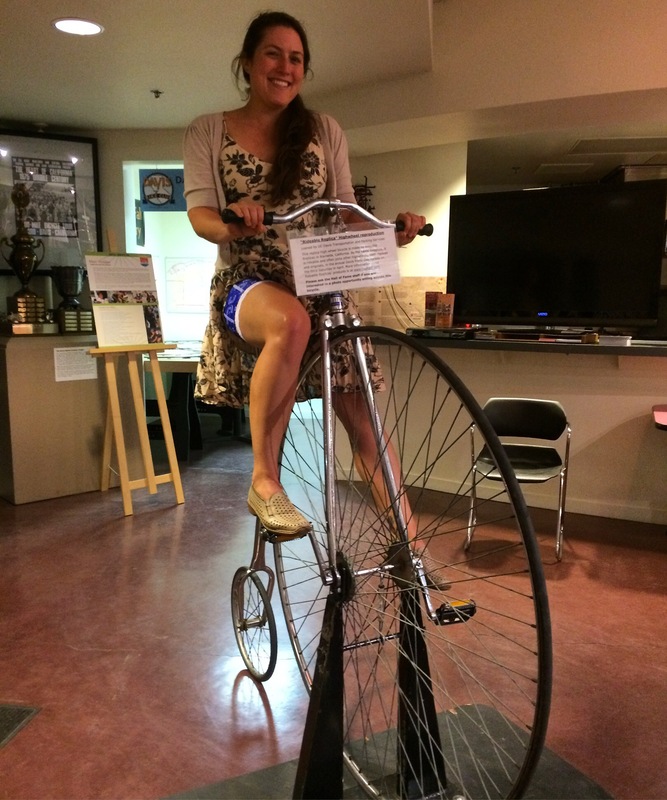 We were greeted with beer and an opportunity to tour the museum, including a chance to sit on a high-wheel bicycle. My turn at the high wheel. So glad I chose my hot pink zebra Bloomers for this night! Awards were presented to the best presentations of the conference, and we got to hear from the mayor of Davis. Dinner was provided by a local taco truck, and afterward, we got to join Bike Party Davis for their monthly party on wheels. 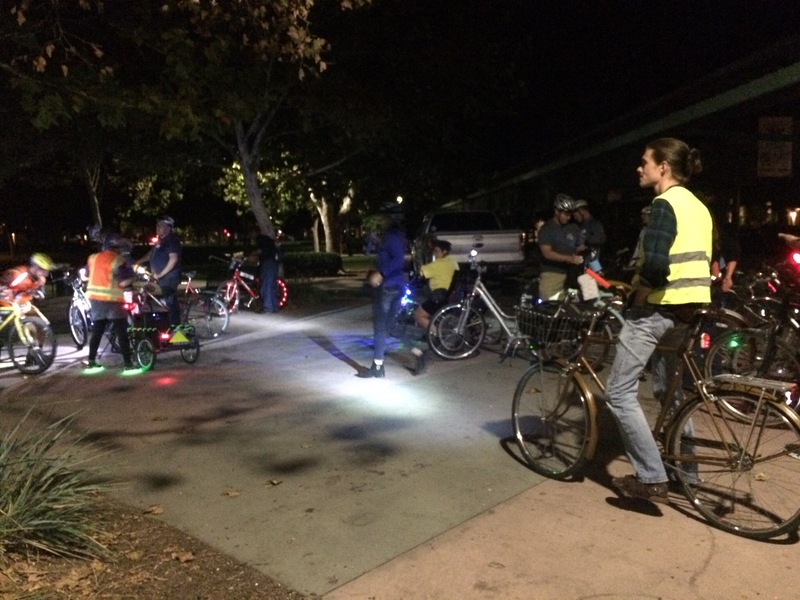 We rolled around Davis by night, with colorful lights flashing, and reggae music blaring (each month, the ride has a different theme, this one was “One Love. One Life.”). 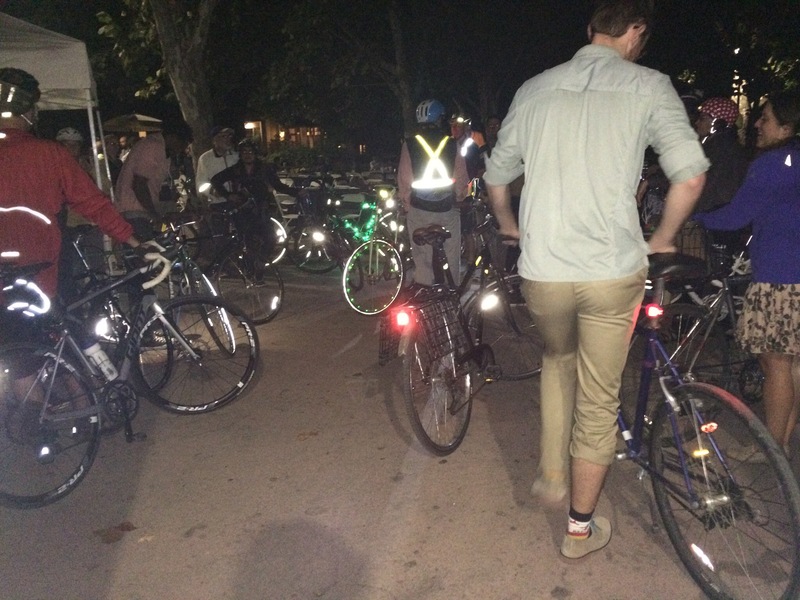 Part of the tradition is to holler out to folks you see as you roll by, “BIKE PARTY!” That was an easy one for newbies to embrace, so we did. We took a fairly leisurely pace, and ended our ride in West Davis, at a pizza place that was offering a donation to the charity of the month (the Youth Education Branch of the Sacramento Food Bank) with any pizza purchased by the revelers. I was still full of tacos, but enjoyed a beer and was able to give a little cash directly to the cause. 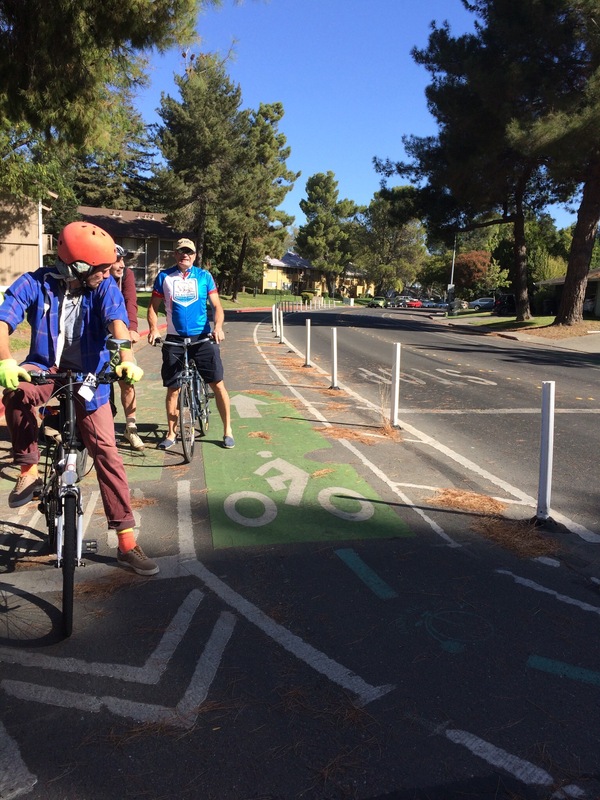 Saturday morning was the tour of Davis’ bike infrastructure. We started out from the U.S. Bicycling Hall of Fame, with our first highlight the “bike lane of shame” (the pathetic thing is only 26 inches wide). 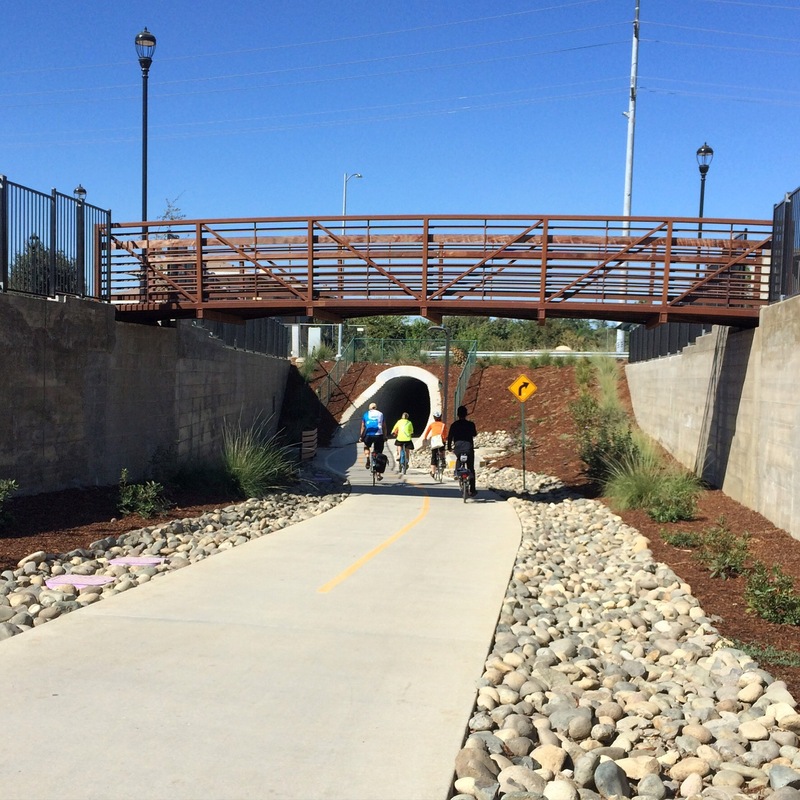 We then rode to campus to see the first bicycle traffic circle in the U.S. We also saw the city’s first bike tunnel (Davis now has 23 of them – so bikes can pass under a busy street, rather then confront a busy intersection full of cars). In addition to showing off the city’s best bike infrastructure, Steve pointed out some road designs that were flawed, and explained how they would be fixed. He talked about the importance of observing how people behave at intersections, and then designing the infrastructure to encourage safer behavior and avoid collisions. Steve explained, as he led us through a series of residential neighborhoods, that the city requires each development to provide access to a greenway. We rode bike path after bike path that was positioned in a greenway that traveled behind rows of homes. We saw many cul-de-sacs that fed directly onto the bike path running through the greenways, and greenways would lead to playgrounds, soccer fields, and schools. 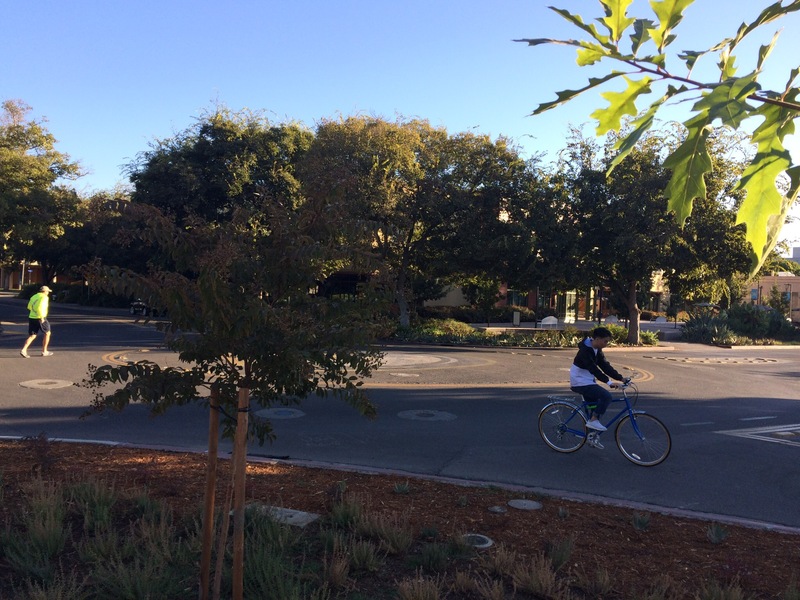 Children in Davis can bike to school (or to a playground, or a soccer game) without encountering very many street crossings. It is amazing, and brilliant! And in places where they did need to cross a street, the crossings were designed with safety in mind. 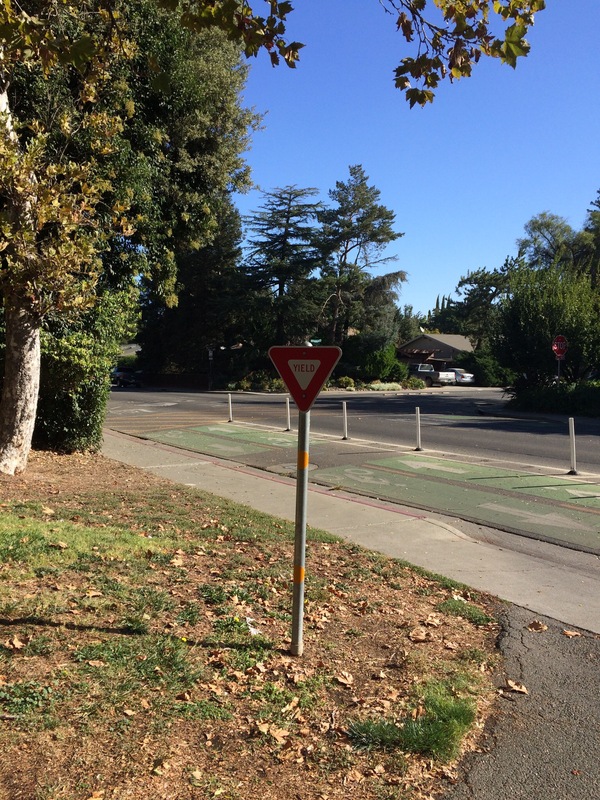 One example had a median, so the bicyclist only has to cross one direction of traffic at a time. 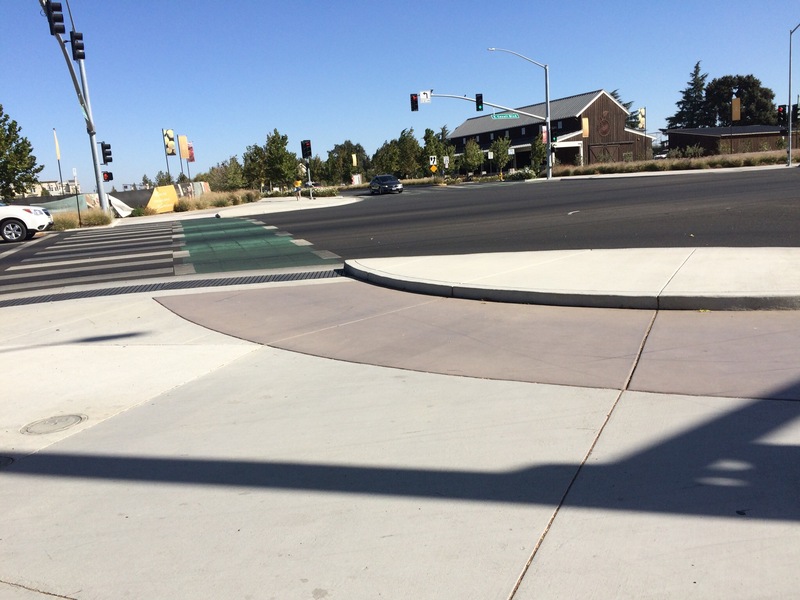 And in the median, the crossing is angled, positioning the cyclist so they are facing diagonally toward the oncoming traffic, making it easier for drivers and crossing cyclists to see each other. We also visited a development built in the 70’s/80’s called Village Homes, a community designed to facilitate community and energy-efficient living. We got our first taste of the community as we entered a path that runs through a bee-friendly garden. 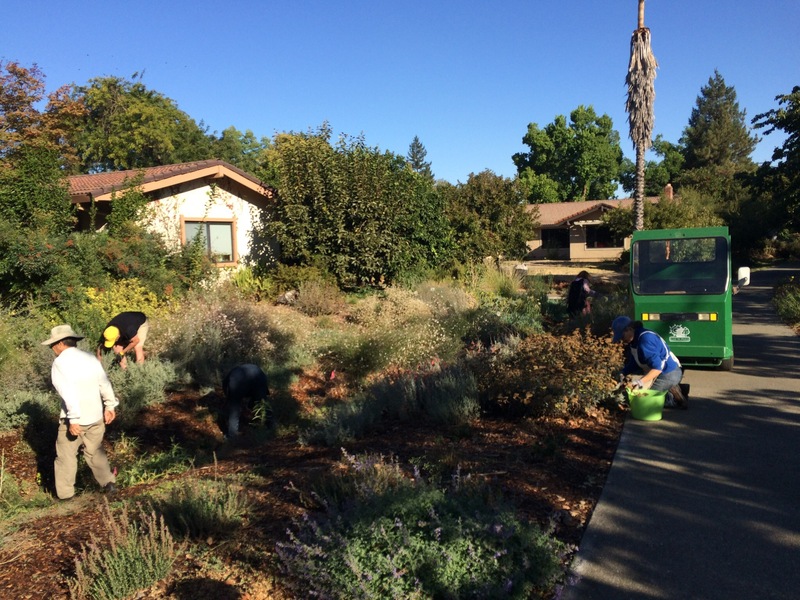 There were a number of people busy weeding, and they explained that they all live in the community and that was their monthly weeding party to maintain the plants that support bees. As we moved through the development, we saw almost no roads, lots of greenery, and attractive homes, most with solar panels. Steve explained that it was a major struggle for the developers to get permits for their plans, as they needed a number of variances. They intentionally put the homes closer together than we normally see, because they wanted to have a large common area rather than lots of individual yards. 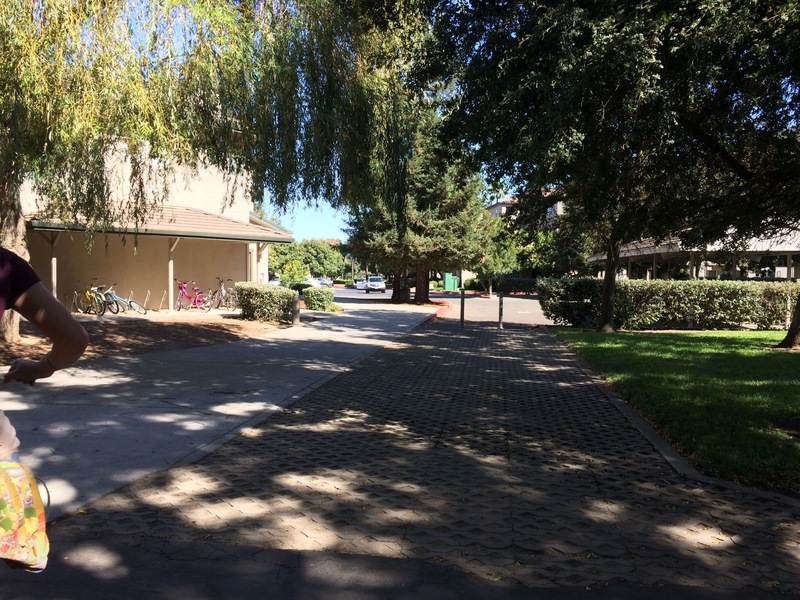 They have a huge grassy area in the common space, as well as an orchard and community garden. It’s a beautiful space, and a great place to live, if you like living in community. One of our featured stops was at what Steve calls the “Faux Dutch Junction”, which was supposed to be an embrace of a Dutch style of intersection, but ended up an unfortunate hybrid of US and Dutch styles of intersection design. The junction was initially designed by Dutch experts. Then some local traffic engineers looked at the plan and thought it needed some revisions. They added an extra bike lane that creates confusion with the special side ramps designed to position bikes where turning motorists could more easily see them. They also added right turn lanes for motor vehicles. The modifications added considerable width to the roadway, and were believed necessary to meet “level of service” requirements (code for maximizing the number of vehicles passing through an intersection over a set period of time). Ironically, these modifications made the road so much wider, they required increased time to be allotted for pedestrian crossings, which, in turn, defeated the level of service objectives. Unfortunately, it isn’t just ironic, it also creates significant safety hazards that will require expensive corrections. “Faux Dutch Junction”. Note the green lane for cyclists crossing, which feeds them into a special carve-out at the corner curb, guiding cyclists to a safer crossing of the perpendicular road. 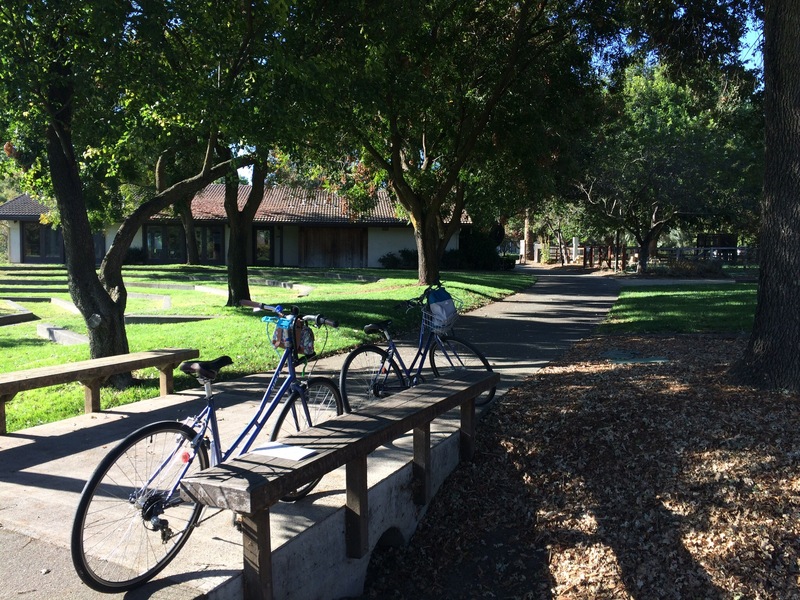 I loved all the bike tunnels we saw around Davis. 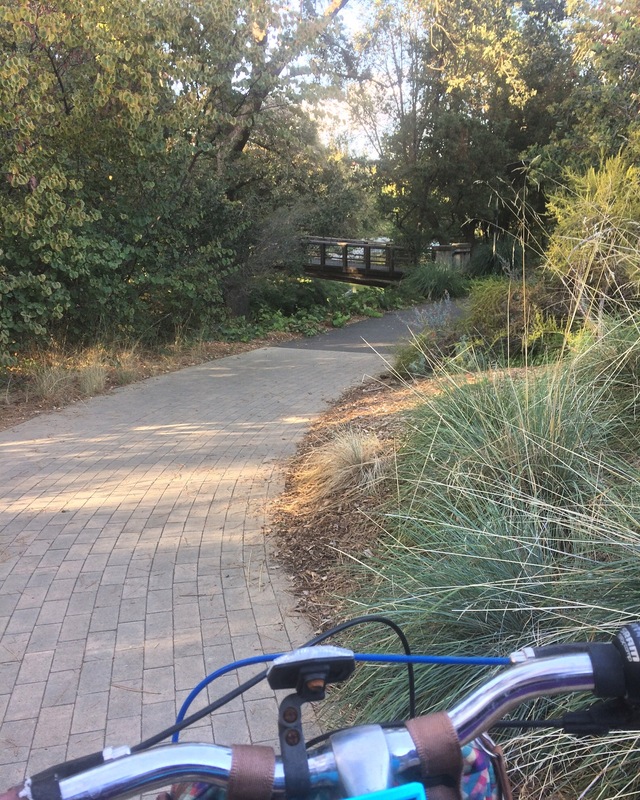 I made much use of a bike tunnel that passes under I-80 to get to the UC Davis campus from my hotel. On our tour, we went through one tunnel that was rather modern-looking, and surrounded by a new residential development. Steve told us that the tunnel itself had been there for 25 years, even though the development just went in a few years ago. Turns out that, when the major road the tunnel passes under was being built, the engineers recognized that this was an area likely to be developed in the future, so they figured it would be smarter to put a culvert in place when the road was being built, rather than have to deal with the greater costs involved to add a tunnel later. Another significant piece of bike infrastructure that shows Davis’ commitment to cycling is the $12 million bridge that crosses over I-80, including over 6 lanes of freeway, two frontage roads, a railroad track, and a bike path. 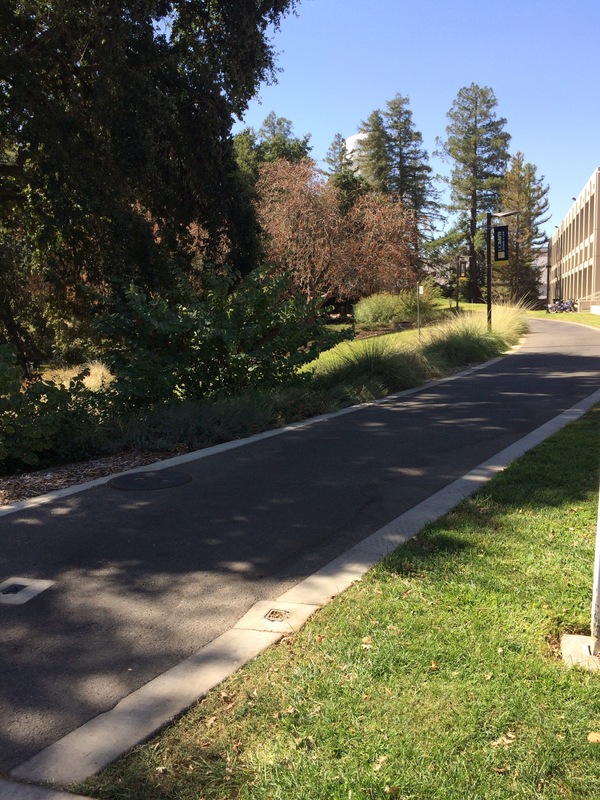 The Dave Pelz Bike Overcrossing is named after the man who served 36 years as Public Works Director for Davis. 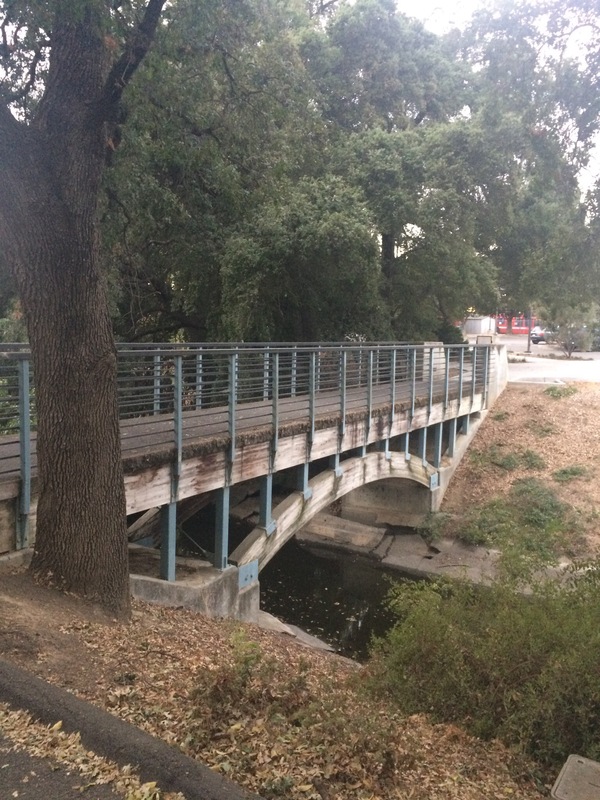 This bridge connects east Davis and south Davis, and is used by many junior and senior high school students. It also represents the highest “hill” in Davis. We ended our tour with a look at an example of the new street standards and lane widths. The old standard was 11feet for a vehicle lane, 5 feet for a bike lane, and 8 feet for a parking lane. The new standard changes that to 10 feet for the vehicle lane, and 7 feet each for the bike lane and parking. It works, and I love it! After the tour, I enjoyed a cup of coffee with Steve, Susan, and Arend Schwab, a professor at Delft University of Technology, who’d been at the conference as well. They shared stories from a recent trip to the Netherlands. 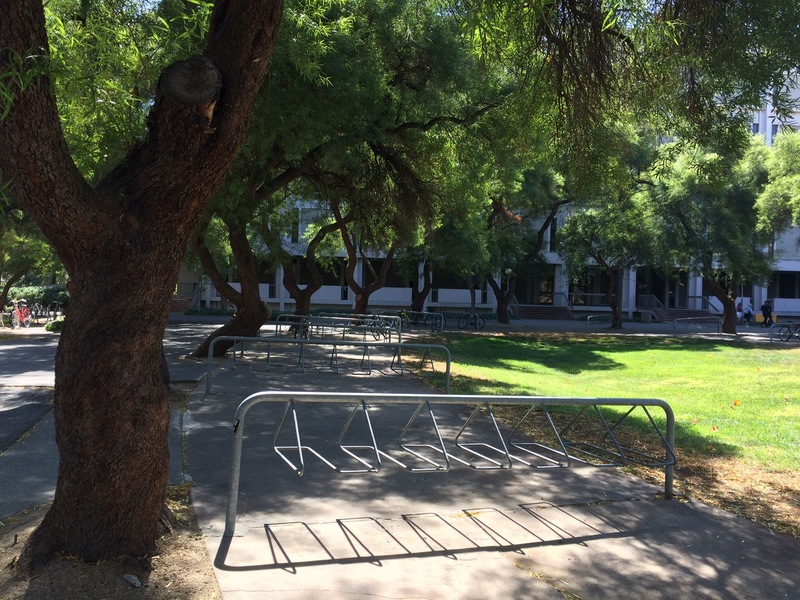 Afterwards, I rode my rental bike back to the Bike Barn, and, while walking back to my car, I snapped photos of the many bike racks waiting for the returning students. The walk was a chance to reflect on my visit to America’s best bicycling city. Quite the velotopia! So long, my velotopia. I’m sure I will return! Fun bike art adorns this fence along the bikeway.